Easter and chocolate. Chocolate and coffee. Coffee and candy. Candy and Mini Eggs. This is how my mind works (for better or worse). As I was scanning my cook books for a cookie recipe I was enjoying a coffee and some Cadbury Mini Eggs. I wondered how I could get all of that into my mouth at once... So I put down the recipe book and decided to experiment. Please join me on this cookie ride. Note: I let the dough set up overnight so this isn't a quick hit. I suppose you could make right away but the cookie tastes infinitely richer if it sits at minimum 6 hours. In a large mixing bowl, sift together flour and cocoa powder. Add sugar, salt and baking soda. Mix well. Add melted butter and mix thoroughly (I use a mixer but not necessary). Add cooled coffee and mix thoroughly. The dough should be extremely sticky with a rich colour. Next up, take about 1 cup of Mini Eggs, put in a bag, grab a hammer and have at it! All eggs should be broken but not pulverized. Add the mini eggs to the mixture. You can mix them in with mixer or by hand. Just mix enough so they are incorporated in the dough. Cover bowl with plastic wrap and put in fridge for at MINIMUM 6 hours. (I like overnight). Why? It allows the coffee to work and enhance the cocoa flavour. I baked a cookie after 3 hours and after overnight - the taste difference was indescribable. Now... Bear with me. There are 2 ways I have done this cookie - the choice will be dictated by the pans you are using. Spray cookie pans with non-stick spray. Grab about a 1/2 cup of granulated sugar in a bowl. Remove dough from fridge - the dough needs to stay cold so you may have to pop it back in periodically during the baking process. Roll the dough into one-inch diameter balls with your hands. Roll the dough balls in the bowl of sugar and place on greased cookie sheet. Flatten slightly and top with mini egg. press slightly into dough. Bake at 350F for about 8-10 minutes. I like these cookies to have the consistency of a brownie so I under-cook them slightly. Wait for 1-2 mins then move from cookie sheet to cooling rack. Remove bowl from fridge and let sit for 15-20 minutes. This dough can be a little soft. Press dough into pan and top with a mini egg. Wait for 1-2 mins then move from cookie sheet to cooling rack. I use a very small spatula to get under the cookie to remove them from pan. This recipe make approximately 40 cookies. I will say that these cookies taste best within a couple of days of baking. I have (successfully) warmed them in the microwave for about 10-15 seconds, topped with ice cream and KA-POW! These sound scrumptious! Coffee and chocolate and cookies! Oh my! 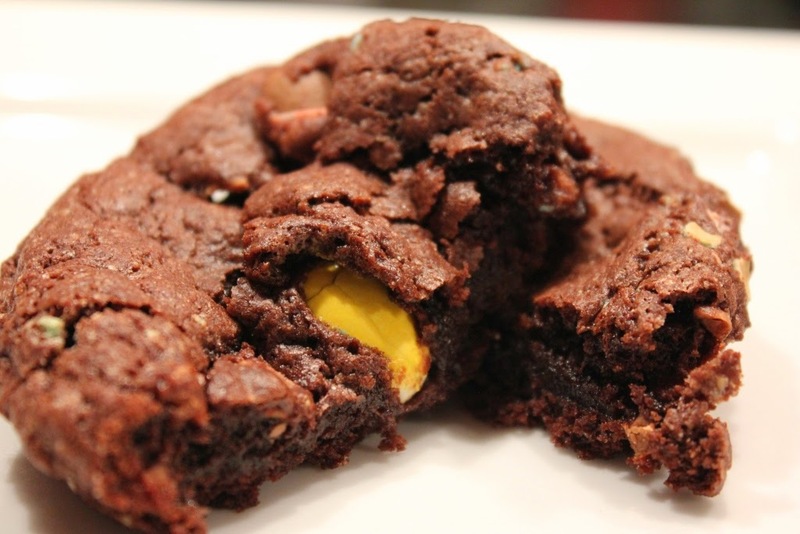 I like to call them the mini-egg cookie for the refined palate! They are not your sweet cookie, but a more complex flavour... Well as complex as cookies with mini-eggs get - hehehehe.